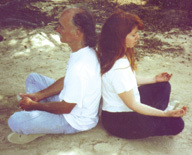 This CD is now only offered as a part of the Land Healing Project. This unique album is designed so anyone with the intent can use it to do land healing ceremonies. 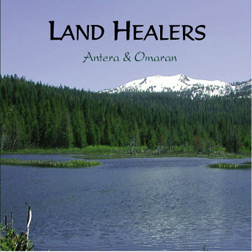 It contains a guided meditation by Antera that leads you through the process of clearing and purifying an area around you, plus three land healing songs written and performed by Antera and Omaran, to sing/chant with in your ceremony. The apparent escalation of natural disasters on our beloved planet concerns all of us. We believe that these are caused by gross imbalances and negativity produced by humans, which Mother Earth is attempting to purge. By using this CD it is possible, through ceremony and directed healing energy, to release and transform these mis-created energies in a safe manner, thus helping the planet cleanse and helping to avoid future catastrophies. This ceremony can be done alone or with a group. The larger the group doing the land healing, the larger the area that can be cleansed. The goal is to have thousands of lightworkers doing these processes around the world, each cleansing the areas where they live, and gradually creating a network of cleared areas that is so strong that a major shift occurs. Please join in this effort! This CD is now only sold with the workshop Beginning Land Healing, a part of the Land Healing Project. 2. Meditation: "Conduits of Light"
4. "We Sing Our Praise"